I had a great time last week attending the American Association of State and Local History Annual Meeting in Oklahoma City. The conference program listed an extensive number of sessions that focused on Museums and Public Outreach. As well, given that the meetings were held in the very heart of Indian Country, a separate “Tribal Track” set of offerings dealt specifically with topics related to Native American cultural heritage. You can check the entire program here. A recent trend considered by many of the presenters is the shift from school group to family museum visits. With school program funding cuts, we are keenly aware of this shift at the C.H. Nash Museum. Sarah Watkins, Curator at the USS Constitution Museum, introduced the Family Learning Forum a project funded by the Institute of Museum and Library Services. The site is packed with resources. Of particular interest are the Success Stories that detail over 50 different family programs in place at museums across North America. The Family Learning Forum website is a fantastic place to experience a variety of museum programs in history, art, archaeology and more. Also, the Denver Art Museums resource link is one example of an institution with an abundance of downloadable guides and ideas for the family visit. Over the past few years, museums and cultural heritage centers have begun using innovative Scavenger Hunts and Geocaching for instructing on a range of topics. Museums are increasingly going beyond the rote “find the answer in the exhibit text” type of scavenger hunt by incorporating role play and gaming. For example Watson Adventure, Urban Interactive, and the Scavenger Hunt Ideas blog were resources presented by Rebecca Crawford of the USS Constitution Museum to consider when developing such activities. The final session on the final day of the conference Of the Student, By the Student, and For the Student was excellent. Journey Through Hallowed Ground from Monticello to Gettysburg and the Colorado Youth Summit were two examples where youth take part in service learning projects to experience history, archaeology, the environment and preservation. I found the most stimulating session at the conference to be The Essential Frameworks of Informal Learning, presented by Beverly Sheppard, editor along with Kim Fortney of An Alliance of Spirit: Museum and School Partnerships. Sheppard noted that only 9% of life is spent in formal learning settings. A take-off point for the discussion was the Learning Science in Informal Environments: People Places and Pursuits from which the Six Strands of Science Learning are taken. Sheppard reported that one year after a museum experience, visitors related less to exhibit facts and more to the affective quality of exposure to the “big idea” of the presentation. The Informal Science website is a resource for further exploration on these areas of inquiry. A lively discussion on experiences with innovative approaches to informal learning followed Sheppard’s presentation. 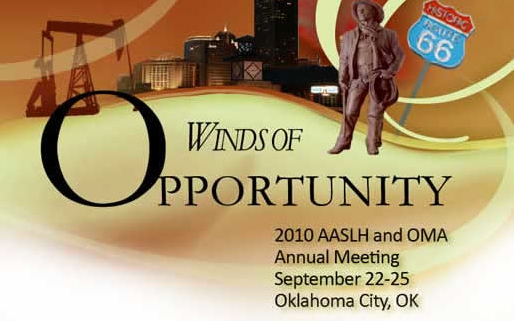 Overall the AASLH sessions were the most stimulating professional meetings on museum matters I attended in quite a while! Were you there? What are your highlights from the meetings? Wish I could have been there!! Glad to hear about the family programs.. I think the family days at the C.H. Nash Museum is a good example of a pretty painless and cost efficient way to engage families that visit the museum. I look forward to reading more about the success stories! Also- putting An Alliance of Spirit: Museum and School Partnerships on my amazon book wish list… Alex at the Pink Palace was telling me about that book last time I visited with her, and I hope to make time soon to read it.